Where is the reset button on my Paragon2 or Paragon3 locomotive? Can I use my new Broadway Limited locomotive on DC? DCC? My Broadway Limited steam locomotive makes sounds but will not move. I have heard I should lubricate my locomotives regularly. Is that correct? My model has been working fine. Now my model has no sound and does not move. What DC/Analog controller do I need to activate the sounds in my Broadway Limited model. I am missing a part off my Broadway Limited model. Are parts available from Broadway Limited Imports? My Broadway Limited Heavy or Light Mikado is registering a short anytime the tender is on the track, regardless of connection to the locomotive. My Broadway Limited Heavy or Light Mikado is registering a short when the tender is on the track, only when the tender is connected to the locomotive. I made a mistake programming. How do I reset my Paragon2 or Paragon3 Series locomotive to defaults? My Paragon2/Paragon3 model offers 28 functions. My DCC system only allows me to access 12. Can I use the others? I am having problems with the smoke unit on my Paragon2/Paragon3 Series steam locomotive. What should I do? Are there any special instructions for programming or changing the address on my Paragon2/Paragon3 Series models? Are the sounds in my model prototypical? How do I turn OFF the smoke unit on my new BLI steam engine. Can I run my BlueLine Series model on a DCC layout? I want to use my BlueLine Series model on a DCC layout. What decoder should I install in my model? I installed a DCC motor decoder in my BlueLine model. Now I have sound, but no movement (OR I have movement, but no sound). Why can't I read CV's from a BlueLine engine on my programming track? Why does my BlueLine Series model run backwards after I installed my DCC decoder? I have read my instructions, but I am still having problems changing the DCC address of my BlueLine Series model. How do I reset my BlueLine Series model to factory default settings? Where is the reset button on my Paragon2/Paragon3 locomotive? Paragon2 and Paragon3 locomotives are reset by pressing the reset button located on the end of the electronics board. On steam locomotives this is inside the tender. Click here for an image of the button (Paragon2 decoder shown, but Paragon3 has the same reset button and procedure). Broadway Limited Paragon Series and Paragon2/Paragon3 Series models can be operated in DC or DCC straight out-of-the-box without making any changes. To operate in DC, place your model on the track and turn the voltage up. The sound will come on around 5 volts. The model should move out around 9 volts. To operate in DCC, place your new model on the track and select loco 03 on your DCC controller. The default address of ALL BLI models is 03. If you change your address accidentally, you can always perform a manual reset and your model will revert to loco address 03. Broadway Limited BlueLine Series models can be operated in DC straight out-of-the-box. Place the model on the track and turn up the voltage. The "start-up" sounds will begin at 5-6 volts. Movement will begin around 9 volts. Note: the start-up sequence must be complete before the model will move in DC. To operate your BlueLine model in DCC, you must install a DCC motor decoder. The sounds will work on a BlueLine model as soon as you put it on the track. However, the BlueLine Series models do not have a motor decoder. After you plug your motor decoder of choice into the 8-pin socket on the circuit board, your model will be ready to operate on default address 03. Most likely, the tether cable between the locomotive and tender is not securely connected. Check the orientation of the pins and push the cable in firmly. Use some small tool if necessary. Be careful not to damage any wires when pressing the tether cable in. Yes. You should apply plastic compatible oil to specific points on the model when you hear squeaking. For steam engines, you should apply oil to all side-rod joints and axle ends when you hear squeaking. For diesel locomotives, you should apply plastic-compatible oil to the axle ends between the wheel and the plastic truck. This will eliminate squeaking at the point where the axle meets the metal pick-up bar in the truck. It may occasionally be necessary to apply grease to the gear tower of both steam and diesel models, especially if you use your models a lot over a long period of time. If you need to do this, follow the instructions in your manual or contact our customer service department at 386-673-8900, or by email at service@broadway-limited.com. Perform a manual reset. The software in your model could be temporarily not performing correctly. The manual reset procedure for every model is in the manual, and also later in these FAQs. If you are experiencing a problem with your model, performing a reset is always the first step. DCC users please note: this reset will change your model's address to 03. 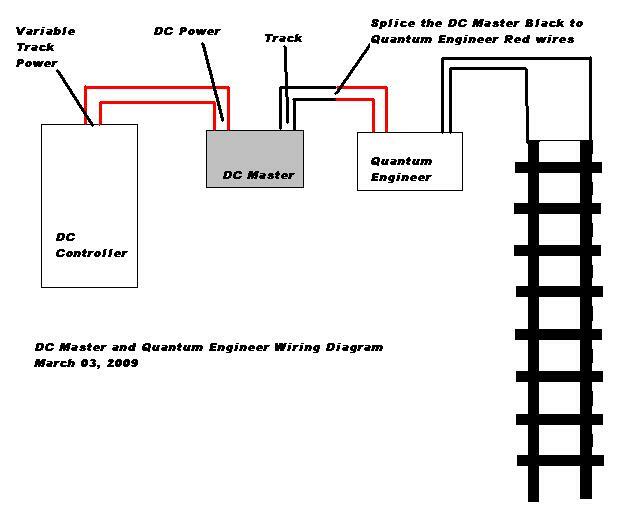 NOTE: The DCMaster and Quantum Engineer can be wired in series between your power supply and the track so that both can be used at any time. Click here for a helpful wiring diagram if you have any questions or concerns regarding the installation of the two controllers. Yes, parts are available from Broadway Limited. You can reach our service department by phone Monday - Friday between 1 and 4 PM. If you have trouble reaching us by phone, send an email to partsorders@broadway-limited.com. One of the tender trucks has been rotated 180 degrees. You will have to experiment to find which one. Gently rotate one 180 degrees and replace on track to test. Both tender trucks have been rotated 180 degrees. Gently rotate both tender trucks 180 degrees, being careful not to damage the pick-up wires running down to the truck. I made a mistake programming. How do I reset my Paragon2/Paragon3 Series locomotive to defaults? There are two ways to reset the Paragon2 locomotives. 1. Using your programming track, reset CV8 to 8. You will hear the coupler crash sound as confirmation the reset was successful. 2. Locate the manual reset button on the main circuit board. Place the model on unpowered track. Press and hold the button. While holding the button, apply power to the track. After you hear confirmation that the reset was successful, you can release the button and re-assemble your model. Loco address is now 03. Yes. Each of the Paragon2/Paragon3 System's 28 functions can be made to work on any of your controller's function buttons. Instructions for this are located in your Operator's Manual. There is likely no serious problem with the smoke unit. Here are four common issues to check with your smoke unit. 1. Too much or too little smoke fluid was added. You should add 3-4 drops of smoke fluid. If you added more than that, you should runt he unit at high speed for several minutes to burn off excess oil. 2. Make sure the slide switch under the front smoke box cover is in the ON position. The switch is located beneath the cab on the underside of the chassis on some models. 3. Make sure the F7 function is active on your DCC control system. It is possible to accidentally toggle F7 to OFF when you are operating your model. 4. There could be an air bubble clogging the smoke fluid reservoir. Gently blow into the smoke stack of the model - this will clear the bubble. No, please follow the instructions in the Operator's Manual of your DCC control system. Yes, Broadway Limited goes to great lengths to obtain actual recordings of the real locomotives. The sounds in each Paragon2 and Paragon3 Series model are accurate and authentic. In DCC, pressing F7 will turn the smoke unit ON and OFF. In DC, use the DCMaster and set CV222 to 21. This makes the smoke controllable by the AUX button on your DCMaster. Next, set CV246 equal to 0. This causes the smoke to be OFF at power-up. Or, if you prefer, each steam engine has a ON/OFF power switch. This is normally located behind the front removable smokebox cover. On some models, this cover is difficult to remove and you may prefer one of the methods listed above. Yes, the BlueLine Series models are designed to run on DC track out-of-the-box, and to run on DCC after the installation of a DCC motor decoder. A BlueLine model has a DCC Sound system. The sound system is a dual-mode DCC decoder. The default address of the sound system is 03. When you purchase a BlueLine model, it does not have a DCC motor control system. The model will only move in DC. If you want to use your BlueLine model on DCC, simply plug a DCC motor decoder into the NMRA standard socket on the main circuit board. Please remember, this means your model now has two decoders. Make sure both decoders are programmed to the same address at all times. Remember: your model already has a DCC sound system. You do not need to install a sound decoder. You can use any NMRA standard, medium sized DCC motor control decoder. There is a chart in your manual with recommended decoders from each manufacturer. We suggest N or Z scale decoders simply because they are physically smaller and are easier to fit into small diesel locomotives. NOTE: For articulated steam locomotives, we suggest you use a decoder with a continuous duty rating of at least 1.5 amps. The BlueLine Sound decoder in the model and your installed motor decoder are set to two different DCC addresses. To avoid this situation, we recommend you program BlueLine models on the main track, in OPS Mode Programming. This way, you always set the addresses of both decoders at the same time. If your DCC system does not allow OPS Mode programming on the main line (Lenz), we recommend Direct Mode programming on a Program Track. After programming to a new address, if you get sound but no movement, this means your Blueline Sound decoder is set to the new address but the motor decoder is set to some other address, probably 3. All you need to do is leave your model on the main track and select loco 03. You should be able to run the model. Use OPS MODE programming to change the address of the motor decoder so that it matches the address of the BlueLine sound decoder. After programming to a new address, if you can run the engine but have no sound, the address of your motor decoder has been changed to the new address, but your BlueLine sound decoder is still set to 03. In this situation, leave the model on the main track. Address it as engine 3. Turn the throttle to start the sounds. You should be able to blow the whistle. Now use Ops mode programming to set engine 3 to the new address. If the above solutions do not work, follow the instructions in the BlueLine manual for resetting the BlueLine sound decoder and the motor decoder to their factory settings. Only Digitrax DCC Systems in PAGE Mode allow a user to read back CV's from a BlueLine sound decoder. The DCC decoder is plugged into the socket backwards. Please see your BlueLine Operator's manual for instructions on orienting your DCC Motor Decoder properly. Click here to view an online version of the BlueLine Operator's manual. Beginning on page 20, there are step-by-step instructions for changing the DCC address with several of the most popular DCC control systems. To reset the BlueLine Sound decoder to factory defaults, set CV8 to 8 using Ops Mode programming on the main line, or Direct Mode programming on a separate programming track. You will also need to reset your DCC motor decoder. Most use CV8 to 8 as a reset. Review the manuals that came with your decoders for reset procedures.